Rose had wanted to do her bit for the war effort, help the boys who were risking their lives fighting the Germans and the Japanese, and maybe see a little of the world along the way. But there was no way she could have predicted the horrors she would encounter and the difficult choices she would have to make. Rose Krantz has made it through nursing school and much to everyone’s dismay, most notably her boyfriend, Malcolm, she joins the Army Nurse Corps. Her first assignment is at Camp Crowder, Missouri. There she meets three nurses who see her through three years in a tent evacuation hospital, four foreign countries, and more human misery than they could have imagined. What they encounter shakes even Rose’s resolve to see it through. These women, and a corpsman by the name of Alfred, form bonds that will last a lifetime. When the war in Europe is finally over, Malcolm surprises Rose with a romantic trip to Salzburg, Austria, where Rose finally realizes what is truly important in her life only days before she was to lose it. A Burnished Rose entertains, inspires, and reminds us what life was like for women of that era, and for the nurses who, right along with the men, made significant sacrifices for their country. During Rose’s time back home she is introduced to an old, childhood acquaintance, Earl Hadwig. Earl takes an immediate shine to Rose and Rose can’t help herself, she is attracted to him as well. Rose tried to avoid Earl, knowing her boyfriend Malcolm is waiting patiently for her back in New Orleans. But time after time, she’s thrust infront of him until they both can’t help themselves. Then Rose knows it’s time to leave. Rose finally makes it back to New Orleans, Malcolm and her old bookkeeping job in Madam E’s upscale Brothel while she finishes up her last year in High School. Malcolm has plans for Rose. He wants to get married soon after Rose is done with school, but Rose has other plans. On a trip back home for her sister’s wedding he father gives her the idea of going into nurses training. Rose thinks this is a great idea, though she’s about the only one (other than her father). In the 1930s nursing wasn’t as respected a career for women as it is today. To most people it was vile and unladylike to do things that nurses did. Teachers and office work were the more preferred professions for women, that is if you weren’t married and with children. Rose picks a nursing school in Baton Rouge, Louisiana, a school, as most nursing schools of that time, run by nuns. She makes it through the rigors of 3 full years of training despite the war that the United States gets pulled into. Rose wants to join the service in a very serious way, but she knows she’ll me more help if she stays her last year and a half and gets her nursing degree. 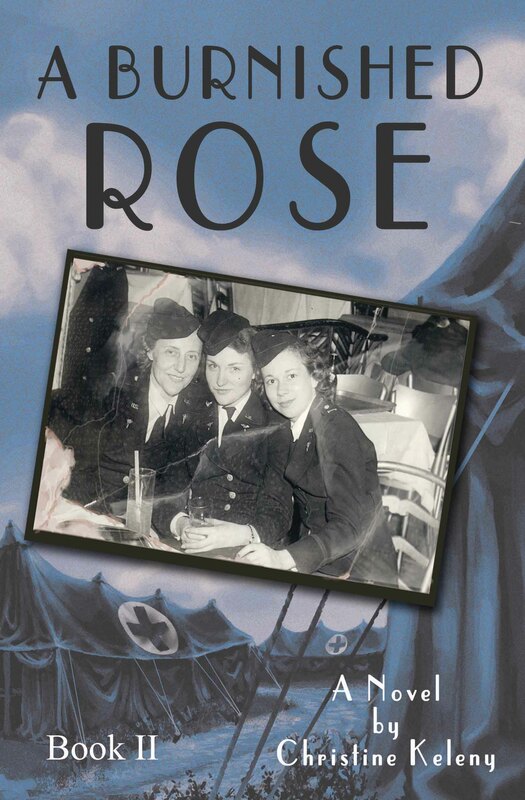 Once out, Rose enlists through the Red Cross for the Army Nurse Corps. This is a surprise to most everyone, especially to Malcolm, who through the preparations the military has been making and the supplies they US had been sending to Europe before America’s involvement, has been doing quite well in his business ventures. He’s ready to pop the question, but doesn’t realize that in the beginning of the war, they don’t let married women into the service, and Rose wasn’t about to stay home – in the States. Rose’s first job in the Army Nurse Corps (ANC) is at camp Crowder, outside of Joplin, MO. There she meets the women she will become very close to. Soon after they apply for overseas duty they are assigned to camp Breckenridge, KY to prepare for their time overseas. Their last stop is camp Shanks, NY, before they take a ship to a destination yet unknown to them. I don’t want to give it all away here, but the rest of the story follows Rose’s time in the service, as a member of the 95th Evacuation Hospital. I was lucky enough to talk to and get information from an actual surgical nurse from the 95th. Her name is Marcy, and she’s a peach. Marcy had memorabilia, letters, supply slips, and even her old dress uniform that I was able to use to help make the story of Rose’s time as a nurse in WWII that much more real. I also took stories from books that a doctor and other WWII nurses wrote about their time in the service. Putting it all together was a challenge. It was a big war, fought on two sides of the world, but with Rose’s brother taking a job with the flying tigers, I was able to show a small bit of what went on for many in that large, world conflict and a bit about what went on at home.